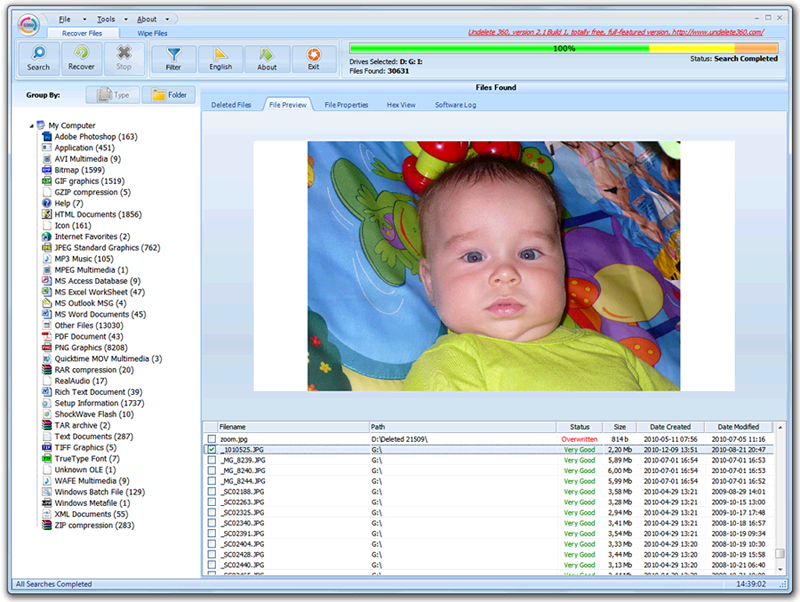 Undelete 360 is a simple file recovery program that can undelete files that have recently been deleted by accident. The program works with any storage media, including hard drives, USB sticks, Flash memory and others. After you select the drive to be scanned, Undelete 360 will quickly scan it for deleted files and present you with a list of what was found, along with an estimated recovery status.Unlike many competitors, Undelete 360 only supports a quick scan method and is NOT able to find files that have been lost due to formatting or partition errors. This type of scan is useful if you need to quickly scan a drive for recently deleted files.In addition to file recovery, the program also offers an option to securely delete any files or folders, so that they cannot be recovered later. Genuine Freeware! No ads, No spyware, No time limits, No feature limits.